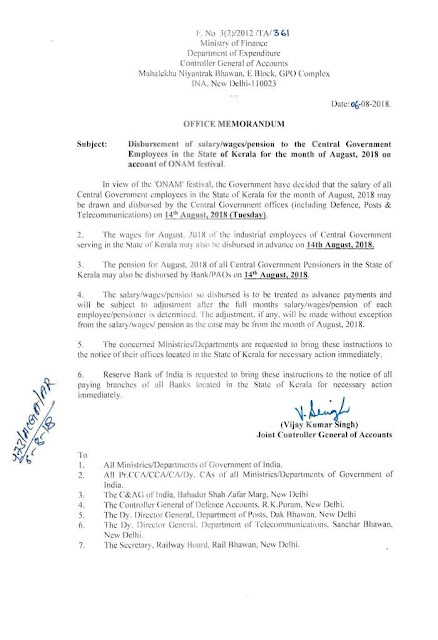 Subject: Disbursement of salary/wages/pension to the Central Government Employees in the State of Kerala for the month of August, 2018 on account of ONAM festival. 2. The wages for August, 2018 of the industrial employees of Central Government serving in the State of Kerala may also be disbursed in advance on 14th August, 2018. 3. The pension for August, 2018 of all Central Government Pensioners in the State of Kerala may also be disbursed by Bank/PAOs on 14th August, 2018. 4. The salary/wages/pension so disbursed is to be treated as advance payments and will be subject to adjustment after the full months salary/wages/pension of each employee/pensioner is determined. The adjustment, if any, will be made without exception from the salary/wages/pension as the case may be from the month of August, 2018. 5. The concerned Ministries/Departments are requested to bring these instructions to the notice of their offices located in the State of Kerala for necessary action immediately.